LABOUR councillors in Dewsbury have been accused of spending money that could have gone to community projects on unjustified “self-promotional” banners. 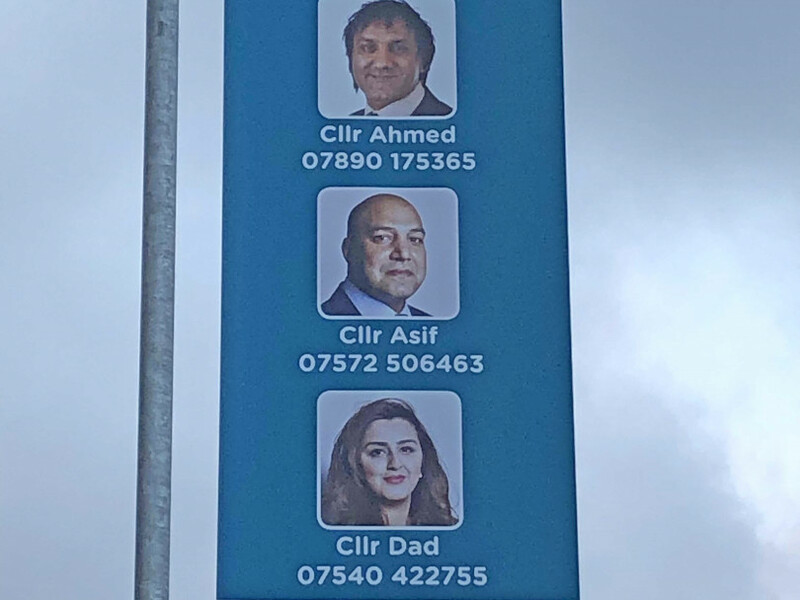 The banners, which feature portraits of Masood Ahmed, Gulfam Asif and Nosheen Dad as well as their mobile phone numbers, were bought from the £10,000 budget allocated to the ward, which councillors are free to use to publicise their names and contact details. Coun Ahmed argued that the banners were a highly visible method of highlighting ward members’ actions, with the reverse containing messages aimed at the public, for example, around fly-tipping and litter. Coun Ahmed rejected suggestions that he had said no council money was used to pay for the banners. Coun John Taylor, deputy leader of Kirklees’ Conservative Group, says his Labour colleagues are guilty of poor judgement. Coun Taylor (Kirkburton) said: “In my ward we don’t buy banners. We knock on doors, produce leaflets or use social media. “We use our ward money to support community groups that are wanting to fund a particular type of activity. “There is a very strong community network throughout the mosques and other community groups where those councillors are well known,” Coun Taylor continued. “I am not saying that they have mis-used funds. What I am saying is that it’s not the best use of them. “There is a public information issue here. “The public need to know this is how their councillors are spending money allocated to their ward and whether that is appropriate or not. Coun Asif called Coun Taylor’s comments “divisive”. Responding to Coun Taylor’s concerns, Kirklees Council’s chief executive, Jacqui Gedman, said the Labour trio had done nothing wrong. Commenting on behalf of himself and ward colleagues Coun Ahmed said: “Coun Taylor knows full well that these information banners are part of the ward allocation to be used by all ward councillors, and as the chief executive pointed out, they do not contravene council policy. “The information banners are placed across the Dewsbury South Ward in areas like Thornhill, Thornhill Lees as well as Savile Town contrary to comments made by Coun Taylor. Coun Asif added: “The tone used by John Taylor was divisive. “This is someone I had great respect for. He was part of cross-party democracy commission work which highlighted that councillors need to be visible. “We get calls from residents directed through Kirklees’ switchboard. “This process can take up to five minutes.